„Never in the field of human conflicts was so much owed by so many to so few”. Among The Few who saved the world, were Polish fighter pilots who, serving both in Nos 302 and 303 Polish fighter squadrons and in British fighter units, played very important role. Only few of pilots who fought during the Battle of Britain, and during the whole conflict, achieved the status of the Ace in a Day as Antoni Głowacki did on the 24th August 1940 while in No 501 squadron RAF. Antoni Głowacki was born on 10th February 1910 in Warsaw where he graduated primary and middle schools. In 1926 he joined Aeroklub Warszawski (Warsaw Air Club). From 1928 to 1930 he worked as a chief of laboratory in the Philips plant in Warsaw. In 1930 Głowacki joined Polish Army and after initial training was sent to the 1st Air Regiment in Warsaw. In 1935 he became officer and three years later, after special course, he became air instructor in Dęblin in the Air Force Cadet School (the famous the School of the Eaglets). There he was serving until the war broke. In September 1939 he was serving in reconnaissance air platoon of Warszawska Brygada Pancerno-Motorowa (Warsaw Armoured-Motorised Brigade). When Germany conquered Poland he escaped to Romania where he was interned. Thanks to determination and sheer of luck Antoni Głowacki was able to escape and join Polish pilots who arrived to France and Great Britain. Scramble of the Hurricane Mk I fighters from the 501 Squadron RAF. Both aeroplanes were flown in combat by Antoni Głowacki. Aeroplane in background was flown by P/O Paweł Zenker, who was killed in action on 24 August 194 , flying Hurricane SD-W P3141. Photo from Robert Gretzyngier collection. He didn’t want to fly bombers. Unfortunately he did not join the first line units that were trained in France. His destination was Great Britain, where he arrived in January 1940. He belonged to the first group of Polish pilots who were going to form bomber squadrons. But it was not Głowacki’s dream as he wanted to be a fighter pilot. However, for half a year he had to accept this assignment. Finally, in July 1940, he was sent to No 6 Operational Training Unit Sutton Bridge. His training lasted until the end of that month. On 3rd August he left OTU and was assigned to No 501 fighter squadron as Sergeant pilot. He arrived there on the 5th August (according to some information his arrival took place on the 4thAugust), but his arrival was not noted in unit’s Operational Record Book (interestingly, on the 6thand 7th August the arrival of other Polish pilots, F/O Witorzeńc, F/O Łukaszewicz, P/O Zenker, P/O Kozłowski, was noted). His first flight took place on the 5th August, in the afternoon. His next flights took place between 7th and 14th August 1940. Those were mainly training and patrol flights with no contact with enemy. Hurricane SD-N, P3059, from the 501 Squadron RAF, August1940. Aeroplane was used bay many squadron pilots, including Sgt Antoni Głowacki, who didn’t achieved any aerial victory with SD-N. Artwork by Marcin Ciepierski, Arma Hobby. On 15th August he shot down first enemy plane. On the Polish Army Day he finally took part in victorious combat. At around 11 o’clock British radars detected incoming big Luftwaffe raid. 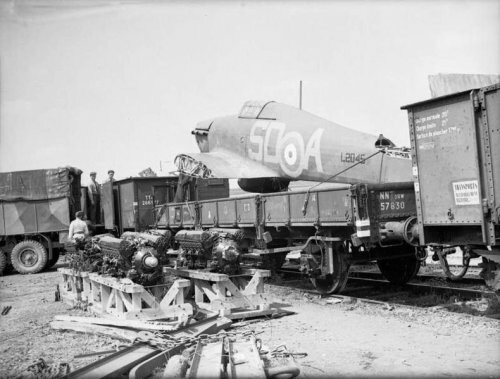 As it was serious situation and four RAF squadrons were sent to face enemy raid – Nos 501, 54, 56 and 615. Głowacki’s unit task was to patrol the Hawkinge area. At around 11.30 enemy formation crossed English coast near Dungeness and divided into two groups. 24 dive bombers Ju87, famous Stuka, of IV (St)/LG1 headed towards Dover and RAF Hawkinge. 11 Hurricanes of No 501 squadron attacked from the sun and claimed 10 bombers destroyed, 1 probable and 3 damaged. The description of this fight can be found in 501 squadron Intelligence Report. 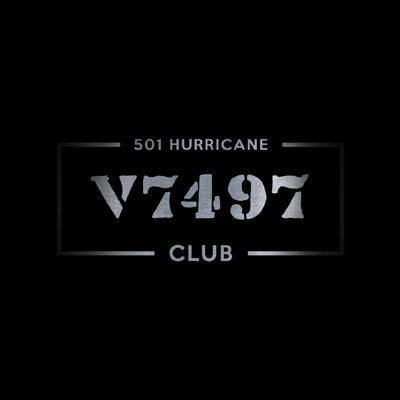 No 501 Squadron consisting of 11 Hurricanes was put to patrol Hawkinge at 5,000 feet and later at 12,000 feet. They were told that e/a were approaching Folkestone at 10,000 feet from south east. By this time the squadron was just to the north of Folkestone and sighted 20+ Ju87s coming in from south east. The squadron came down south wheeling right round to follow the enemy towards Hawkinge, thus cutting off the enemy’s retreat. ‘A’ Flight in the front led the attack on the formation of Ju87s and each shot down one of these planes. Yellow Section attacked other formations of Ju87s singly, the squadron having broken formation. Some of the pilots were attacked by Me109s and He113s. Two of our pilots bailed out, Blue 1 (F/Lt Putt) landing in the sea. He was picked up later, Red Section directing the rescue boat. Yellow 1 (P/O J A A Gibson) also bailed out, landing near Folkestone. Eight aircraft landed again at Hawkinge at 12.00 hours and another landed at Gravesend. Our own losses in aircraft were two Hurricanes and no personnel. Enemy casualties were 10 Ju87s destroyed, 1 Ju87 probably and three Ju87s damaged. The squadron was coming from area north of Folkestone and intercepted 20 Ju87s and attacked whole formation with ‘A’ Flight leading. I attacked Ju87 that was diving, shot a short burst and saw rear gunner bailing, who cartwheeled over my a/c. I saw enemy a/c diving towards the sea. Then I climbed over Hawkinge and attacked Ju87 from behind but I was not able to see what happened to him. Then I made a beam attack on He113 with 90 degrees deflection and e/a started climbing and then disappeared. Then I turned around to attack a Ju87s over Folkestone but I ran out of ammunition after a short burst. I returned and landed in the base. What is interesting, in his memoirs Głowacki mentions shooting down another two enemy aircraft – one was to hit the water near Dover and the second fell on the house in the Shorncliffe Crescent, Folkestone. However, according to documents, the latter was P/O John A Gibson’s victim. Two more Ju-87 shot down were officially atributed to P/O Stefan Witorzeńć. 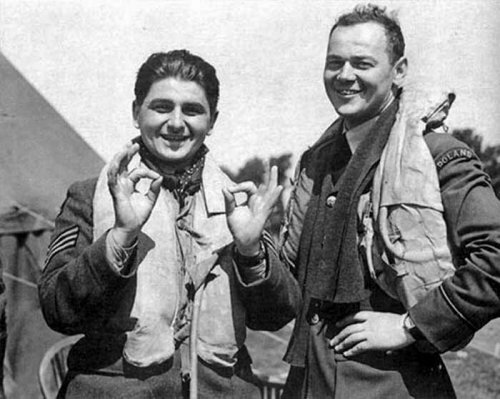 Sgt Antoni Głowacki and P/O Stefan Witorzeńć during service in the 501 Squadron RAF, August 1940. Photo from Robert Gretzyngier collection. In this combat Luftwaffe lost only two Ju87s. Both belonged to 10/LG1. Another two bombers returned to base damaged with rear gunners wounded. I was No 2 in Blue Section when the Squadron consisting of 7 aircraft was ordered to take-off to intercept enemy raid behind Dover at 8,000ft. Over the R/T we were told that enemy aircraft were at 5,000ft and we dived over Dover. While diving I sighted wave of Do17 and Do215 at 12,000ft approximately crossing the coast from southeast near Folkestone. Red Leader led the squadron round to southeast and then northwest parallel with the enemy and then we climbed to attack. Red 1 attacked the second wave of bombers and from astern at the same height I attacked the third section while my leader Blue 1 attacked the fifth. They broke up and I attacked a Do215 with a beam attacked from third quarter using full deflection. The enemy aircraft dived emitting white smoke and turnedover as it dived. I attacked a second aircraft from astern with a long burst breaking off when my ammunition was finished. I did not see what happened to it. I divied to 3,000ft and could see Rochester being bombed. I then turned to base. 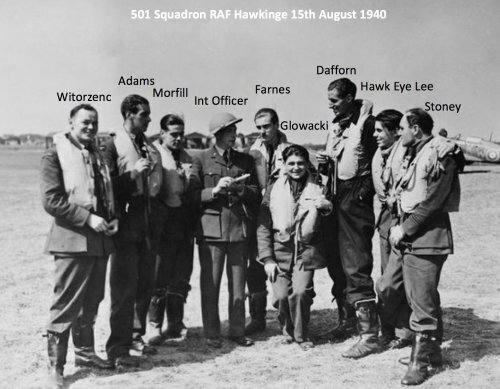 In the morning of 16th August 501 squadron was moved to Hawkinge. According to unit’s Operational Record Book, pilots flew three combat patrols – one in the morning and two in the afternoon. Sgt Głowacki flew in two of them, with no contact to enemy. Deteriorating weather on the 17th allowed pilots to rest before te following day, that turned out to be the most difficult day of the Battle of Britain. On the 18th August, known as the Hardest Day, Luftwaffe carried out heavy raids on British airfields. At around noon British radars detected first groups of German planes heading towards southeast England. At 12.30 12 Hurricanes of 501 squadron took off to patrol over Kent. In the clash with Messerschmitts unit lost four aircraft (including one flew by a Polish pilot, F/O F Kozłowski, who was severely wounded). 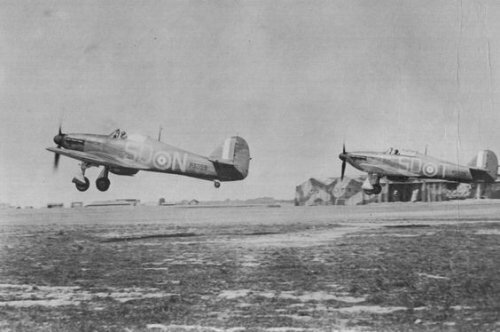 At the same time further four Hurricanes were scrambled to patrol over Gravesend. This group also made contact with the enemy. In the afternoon squadron fighters were scrambled again. Over Kent they met the enemy and in the engagement two Polish pilots claimed victories – P/O S Witorzeńc and P/O P Zenker shot two Bf109s. Next few days proved that the weather was stronger than fighting sides and pilots could relax and rest after heavy combat. Several squadrons were scrambled only to land after short time. 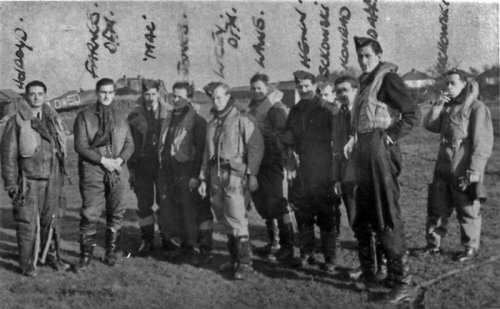 Antoni Głowacki (crouches, which emphasizes its short stature) with 501 Squadron RAF pilots. Would anybody from our readers help with recognition of the persons visible? In the backgrount is visible Hurricane from 615 Squadron. Photo from Robert Gretzyngier collection. At around 10.00 the unit scrambled for the second time. This time they engaged with a bomber raid. The fight took place near Dover. First the Flight A attacked bombers and they managed to disperse them. Only then the German fighter cover reacted. The Flight B rushed for help so general dogfight started and Sgt Głowacki claimed one fighter. Was Green 2 and took off with the squadron from Gravesend at 9.35 and landed at Hawkinge after the mission. During the patrol, at around 10.30 I saw around 30 e/a heading north west, crossing the coast north of Hawkinge. We turned towards them and Flight A attacked rear of the bomber formation and I saw German fighters (Me109s) attacking Flight B. I engaged in dogfight with Me109s that I shot down. E/a which I followed, hit the ground and exploded. When the bombers were attacked I show them releasing bombs 10 miles south-east of Canterbury. During this combat P/O Paweł Zenker lost his life. I was Green 2 when the Squadron took off from Gravesend to patrol Dover area and climbed to 20,000ft. Enemy formation of fighters and bombers was seen at 13,000ft when it was approaching from Lympne, making “S” shape maneuver heading towards London. We turned west and attacked them south-west from Maidstone. Me109s made circle and attacked from the sun. I started a dogfight with Me109 and shot it down in flames. Then I climbed and attacked the last bomber in the formation and spent rest of ammunition. I noticed white smoke from one engine and observers on the ground saw it falling down to ground. Hurricane SD-A, Lucky”A for Antek” Głowacki’s aeroplane with total of seven kills claimed on 15 and 24 August. “Antek” is Polish short form from Antoni, nickname that was not popular among RAF pilots that prefer English: “Toni”. His last Battle of Britain kill was achieved on 28 August flying SD-O, P5193. Artwork Marcin Ciepierski, Arma Hobby. No 501 squadron opponents were fighters of JG 51 and bombers of KG 76. That day the first unit lost 8 aircraft, including one that returned to France badly damaged. Of remaining seven aircraft, three were lost in mid-air collisions. So we have four Bf109s which might have been Głowacki’s victims. One of them was Bf109 E-4 flown by Oberfw Beeck. He had to do a forcelanding on a field in East Langdon, Kent. Remaining three crashed in the sea. One of them was Bf109 E-1, the pilot was rescued by Seenotdienst (according to available sources the pilot had to ditch after engine failure). Two Bf109 E-1 were lost during combats over the Channel. The pilot of one of them , Uffz. Delfs, had to leave his mount and use his parachute, but returned to France after the action performed by Seenotdienst. The second pilot, Uffz. Kroll, lost his life in a combat. As other pilots of 501 squadron did not claim any Bf109s these could, probably, have been two Messerschmitts claimed by Głowacki. Unfortunately I was not able to find any information about the fourth of his victims. Scramble of the Huricane from 501 Squadron, artowrk by Marcin Górecki, KroghulFactory. Kampfgeschwader 76 lost four Ju88s during engagement over Manston, one of them claimed by AA artillery and the second returned to base badly damaged. Remaining two were lost with crews. But it is hard to say which of them was Głowacki’s, especially if we take into account that other pilots of 501 also made claims of enemy bombers. Cherry on top was an application for Distinguished Flying Medal dating 25thAugust for he success Głowacki gained the day before. 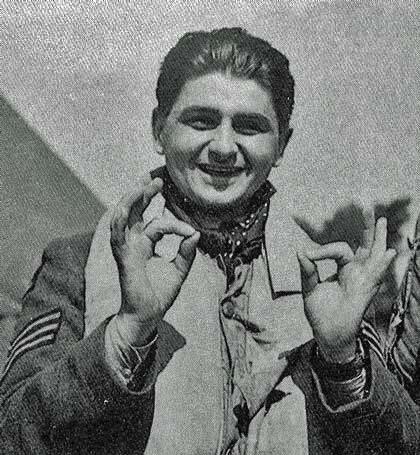 In the following days of August Antoni Głowacki continued his service within 501 Squadron scored next successes, including one Bf109 on the 28th and damaging Bf110 and He111 on the 30th. The Battle of Britain was the first struggle when air forces were used for such a scale. Almost every day thousands RAF and Luftwaffe planes took off to fight. The chaos of fighting led to situation that both sides thought they shot down more enemies than it was in reality. Overclaiming was common and it arose from difficulty in judgement during combat with multiple enemies at one time. After the war, thanks to possibility of checking Luftwaffe archives, it was possible to verify actual losses, although sometimes it is not possible to do it without any doubts. Today it is hard to judge if Sgt Głowacki shot down all planes he claimed (and were approved as confirmed by the command) but on those days of August 1940 the sky over Southern England was the scene for numerous combats between scores of Royal Air Force and Luftwaffe planes. In many cases several pilots shot at one target. However, it does not diminish achievements of a pilot who fought and was lucky to survive the whole war. When I started writing this article I knew that it would not be an easy task, especially when we take into consideration the access to primary sources. That is why I would like to thank Robert Gretzyngier and Wojciech Zmyślony for their help in getting most reliable data about Antoni Głowacki’s combats and RAF and Luftwaffe documents.